“If I have seen further it is by standing on the shoulders of Giants." Welcome to the Cleveland Chiropractic College Alumni Association webpage. The Alumni Association was founded in 1943 by Dr. Ethelbert Stalling and Dr. Buell Boring as a way to advance the cause of Chiropractic, the Cleveland Chiropractic College, and its graduates of both the Kansas City and Los Angeles campuses. As Cleveland Alumni, we remember our heritage by remembering those who selflessly sacrificed so much so that we could build a better life for ourselves. 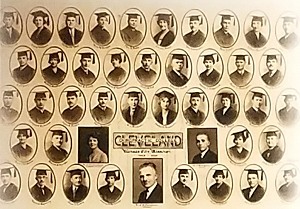 As Cleveland Alumni, we cherish the opportunities to celebrate our chiropractic heritage and traditions. As Cleveland Alumni, we live in the resolve to make this a better world for those who have followed us into the profession of chiropractic as a Cleveland graduate. Please take this opportunity to view our website and renew your connections to your friends and colleagues. Take this opportunity to forge bonds of professional friendships with current students and faculty for the best possible future for all of us. If you are a current Alumni Association member, we are infinitely grateful for your support. If you are not a member, we would love to hear from you and process your membership application so that together the future is brighter for Chiropractic.